Last March 5-6, 2011, over 200 runners braved the third Bataan Death March 102k Ultramarathon, an annual event commemorating the lives of US and Filipino armies who died in the historical Bataan Death March during World War 2. 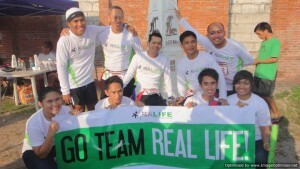 Out of the 200 runners, five of them ran to raise PHP 500,000, to support the Real LIFE Foundation. Joshua Suarez, who also ran last year’s Ultramarathon to raise support for Real LIFE, encouraged four more runners to join this year’s event—Victory Metro Manila pastors Junn Besana and Ferdie Cabiling, together with running enthusiasts Alden Meneses and Paul Pajo. The race officially started 10:10 PM of Saturday, March 5 in Mariveles, Bataan and ended eighteen hours later in San Fernando, Pampanga. In spite of their long and grueling journey, our runners were able to finish the race, and finish it strong! As they crossed the finish line, they were met by their families, friends, and Real LIFE staff and scholars who cheered them on. In behalf of the Real LIFE Foundation, we would like to thank you for supporting our runners through your prayers and giving. Your help surely goes a long way in building a better future for our scholars! Rhia Atilano is an administrator for Real LIFE Foundation. She’s also the resident storyteller at Real LIFE’s weekly feeding program in Pasig.